If you haven’t already heard, the Minions are coming. And they are CUTE. 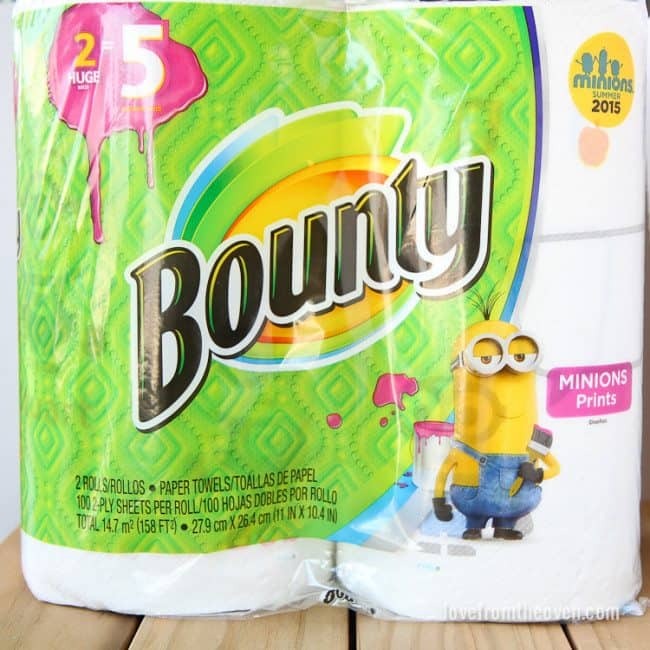 To celebrate the upcoming release of Minions on July 10th, Bounty has released Bounty Minion Prints paper towels and napkins. They are absolutely adorable and available in stores nationwide starting this month. 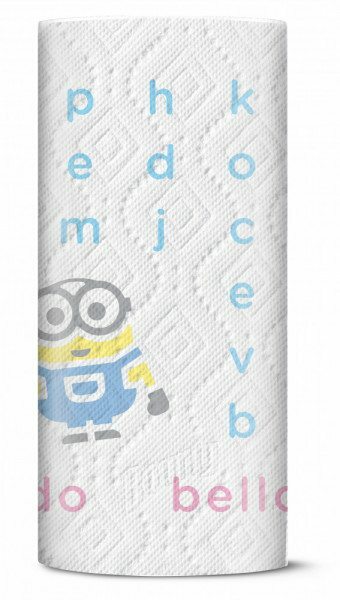 My little one has actually been asking to help me clean, just so she can use these super cute Minion paper towels. Thank you to Bounty for sponsoring this post. 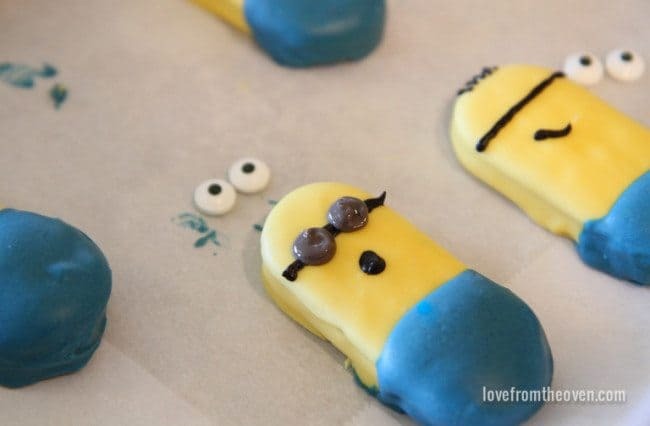 With my little one a bit smitten by the Minions, I decided that it would be fun to make some easy no-bake Minion cookies, similar to the cookies from my book, Smart Cookie. 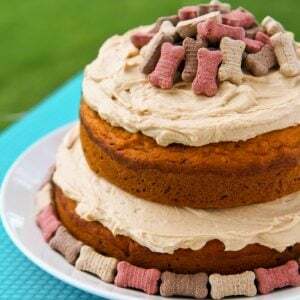 No baking required, just fun decorating. 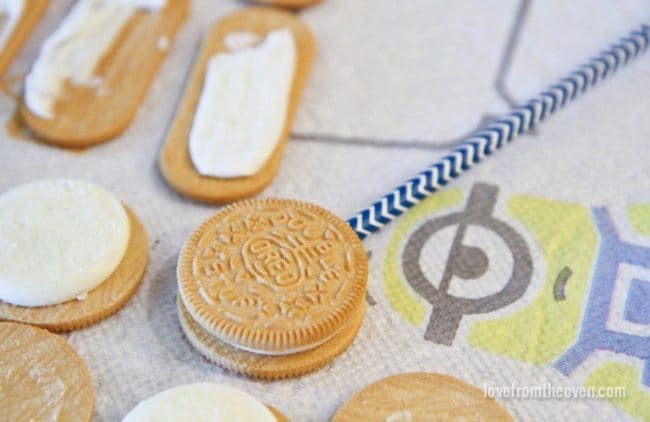 The Bounty Minions Prints obviously make the perfect backdrop for these cookies! I made two different types of cookies, cookie pops using round sandwich cookies and regular cookies using Vienna finger cookies. 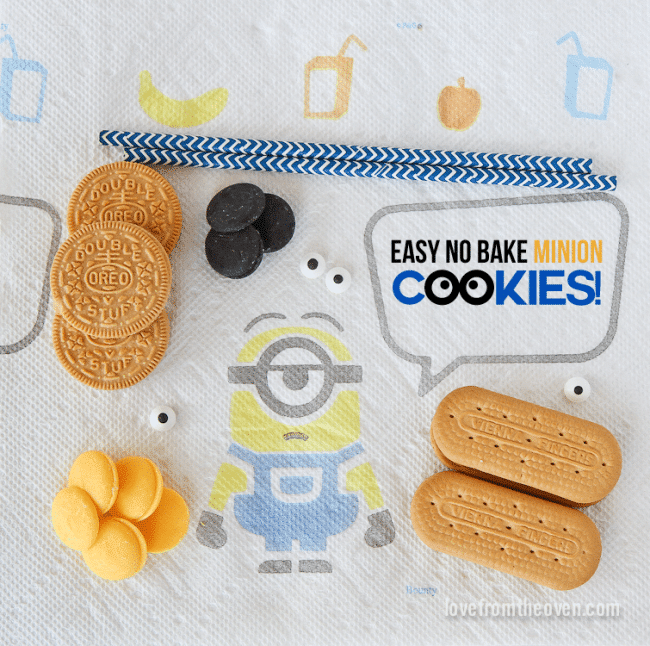 These cookies are really simple, dare I say Minions could make them? 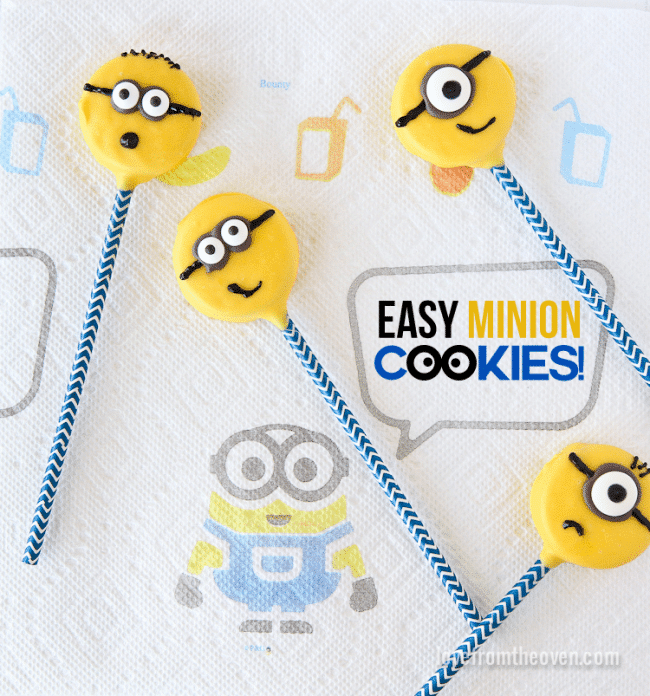 🙂 You just need some cookies, candy coating melts, candy eyes and some paper straws or lollipop sticks if you want to make your cookies into cookie pops. 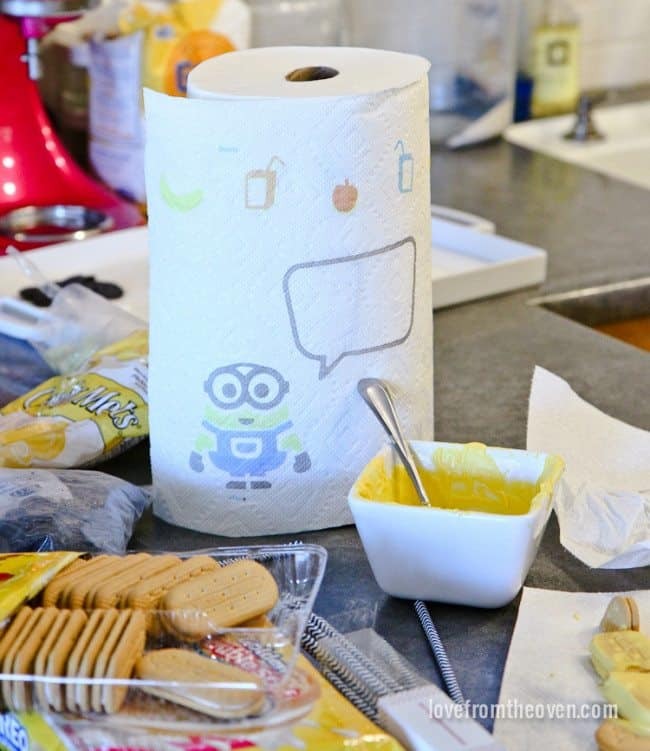 And of course some Bounty Minions Prints paper towels for cute, quick and easy clean up. I love the idea of little Minion Quicker Picker Uppers! 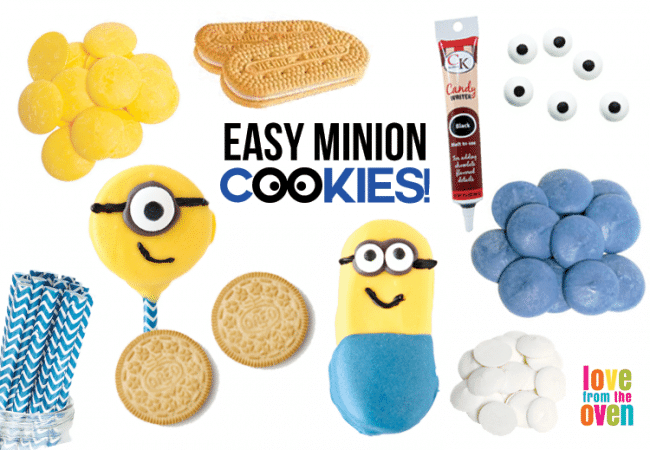 FOR MINION COOKIES YOU NEED: Cookies (Oreos and/or Vienna Fingers) Candy Coating Melts (such as Wilton Melts) in colors such as yellow, blue, black and white, Candy Eyeballs, and Paper Straws or Lollipop Sticks (if making pops). 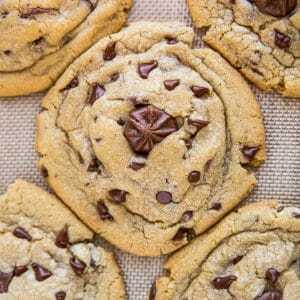 For cookie pops, you want to start by opening your cookies gently. Once your cookies are opened, you will melt some of your candy coating melts according to package directions (the color won’t show, but I used yellow), dip your straws or sticks into the candy coating, then gently press them into the filling of your cookie, then replacing the tops of the cookies. 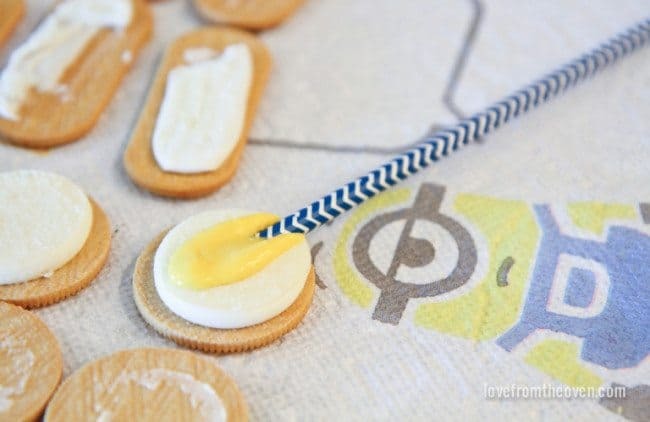 Basically you want to ‘glue’ the straw or stick inside the cookie using the candy coating. 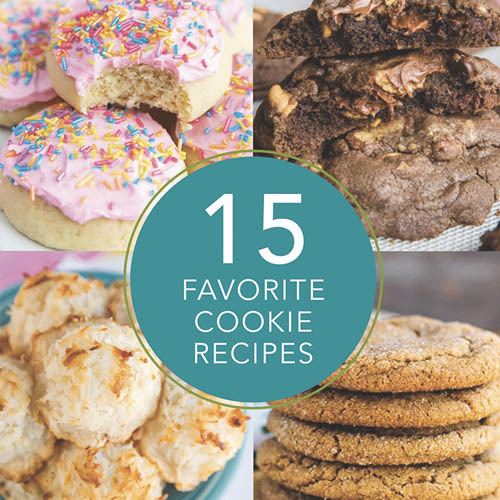 After this I put my cookies in the freezer for 10 or so minutes. 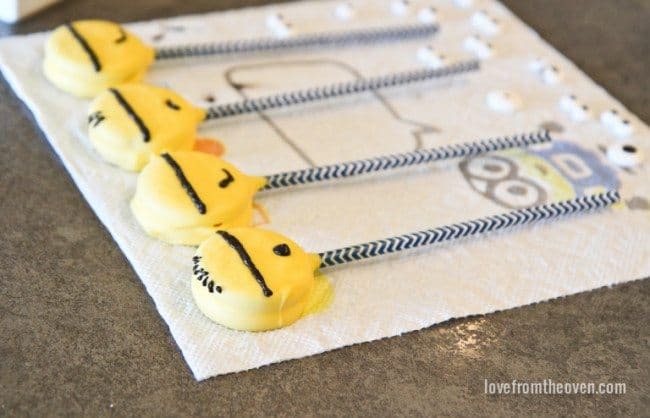 After your cookies have had some time to set up in the freezer, it’s time to dip them in the yellow candy coating. You can see how I did my cookie pops in this video below. You won’t be covering these cookies in sprinkles as you see me doing in the video, just dipping it in the yellow candy coating. 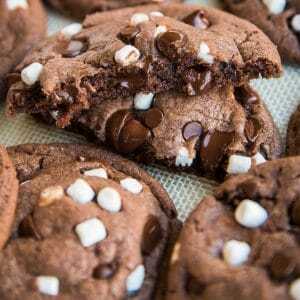 After you dip your cookie, place the candy coated cookie onto a baking sheet covered in wax paper to let it dry. Repeat with your remaining cookies. 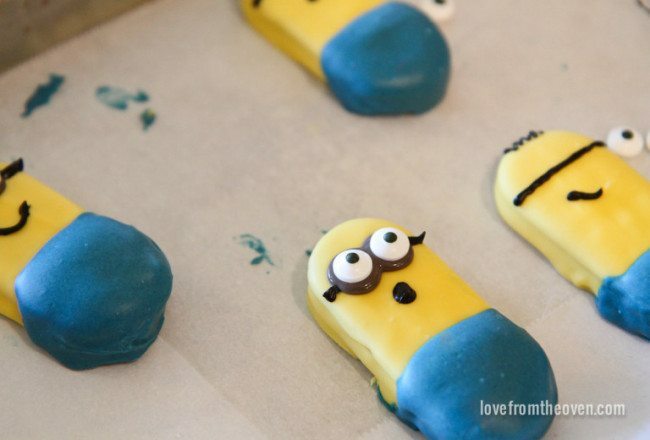 After you allow the yellow candy coating on your cookies to dry, then it’s time to make them look like little minions. 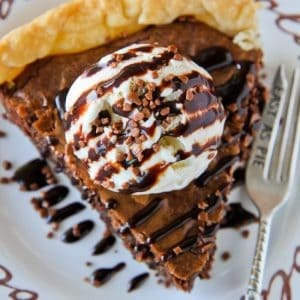 And if you are like me, make a mess. My kitchen usually looks like a disaster when I’m cooking, baking or decorating, but it’s all good. A little Bounty and I’ve got the mess cleaned up in no time. Much funner with these cute little guys looking at me! For the round cookies, the next thing you will want to do is use either black candy melts or a black candy writer (not the edible marker, the kind with the chocolate candy coating inside) to pipe a line of black candy coating across your cookie to create the strap for the glasses, the mouth and if you want a few strands of hair. If you want, you can go ahead and use your black candy writer or candy coating to pipe on some round spots to place the candy eyes. I mixed my black candy coating with a bit of white candy coating to get more of a gray color that I then piped on where the candy eyes will go. You want enough of it that it peeks out from behind the candy eyeballs to create little frames on the glasses. As you can tell, my little guys are far from perfect. The kids love them no matter what, so don’t stress yourself out over piping on your candy coating perfectly. Have fun with it! 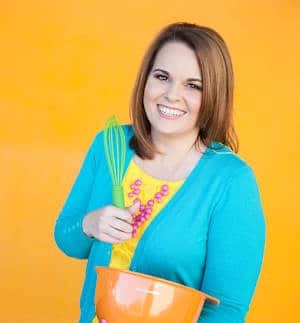 A standard size 12 oz bag of yellow candy melts (such as Wilton) will provide you with enough candy coating to make approximately 18 round cookie pops. 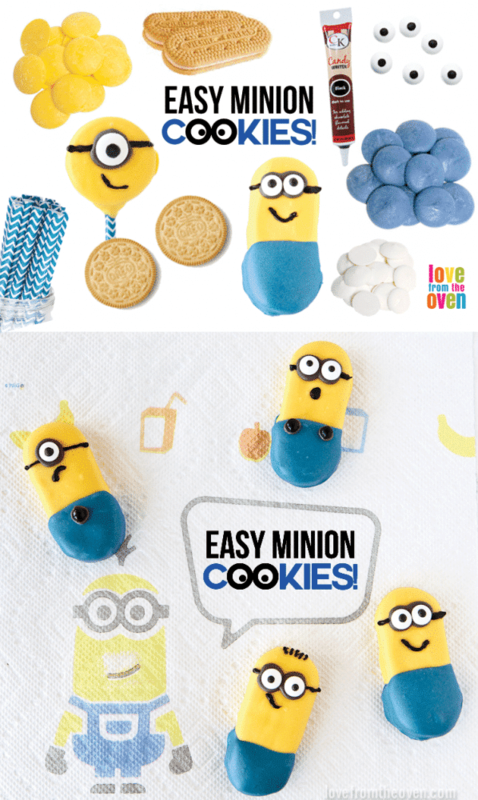 For the Vienna Fingers, using both blue and yellow candy melts, you can make approximately 30 cookies. To go the non pop route, use a cookie such as Vienna Fingers or Nutter Butters. Start by dipping the top 3/4 of your cookie into the yellow candy coating, then letting it dry. After it’s completely dry, you’ll did the bottom part of your cookie into blue candy coating, making sure the blue coating overlaps the yellow. 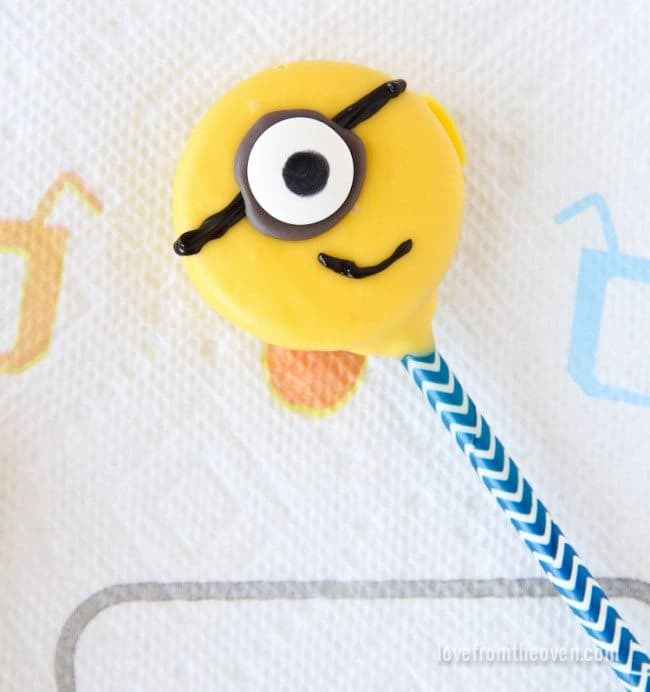 Once all of the candy coating dries, you can pipe on the glasses, mouths and hair, just like with the cookie pops. 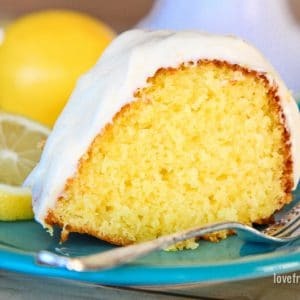 Quick, easy and so fun. I think these little guys are my favorites. Then just let the candy coating dry completely and they are ready to enjoy. Thanks to Bounty you’ll have the kitchen cleaned up in no time, even if you don’t have a house full of Minions to help. 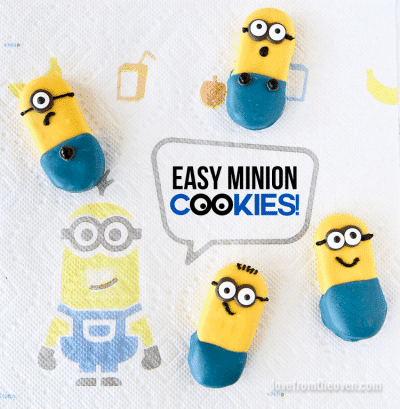 Whip up a batch of these fun no-bake Minion cookies, clean up the kitchen with some Bounty Minion Prints paper towels and get ready to check out Minions, in theaters July 10th. 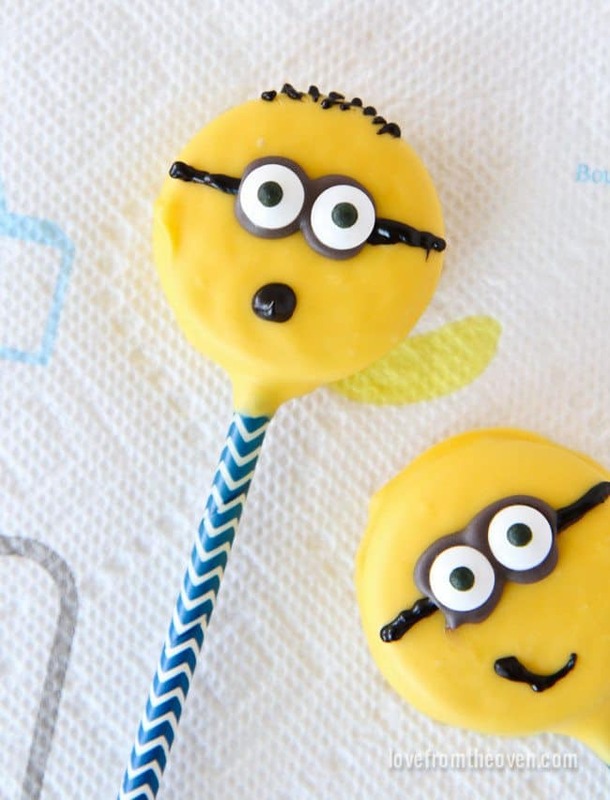 And if you are having a Minion party this summer, these cookies are a must! 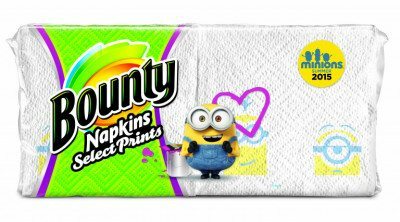 Don’t forget Bounty also makes Minions Print napkins! Disclosure: This post was sponsored by Bounty. All opinions however are mine and mine alone. How cute and easy. 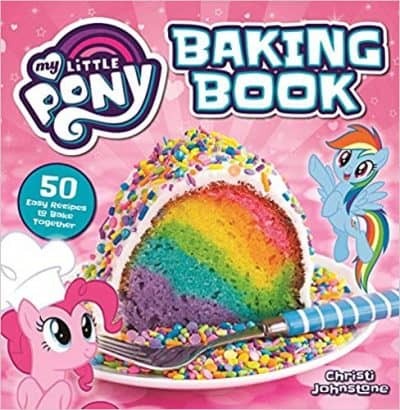 This would be great for a kid’s party. Oh my gosh, I wish I had half your creative mind! These are so cute and kids would go wild for these! 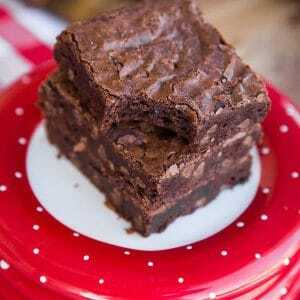 I simply can’t wait to make these!! !